Category Archives: Windwos Live. I Love U…. Adi….. The update means that the service is now located at http://home.live.com/status, different from the previous status.live.com. Besides an URL change, the website itself also received some minor enhancements, now reporting real-time service status of Windows Live Family Safety and Windows Live ID as well. Given that Windows Live ID will become a core part of the upcoming Windows 8, it makes sense that this service needs to be monitored closely and provides the latest status info to its customers. You can check out the new Windows Live Service Status website now at http://home.live.com/status. The rumors were right. Microsoft announced on May 10 that it bought Skype, an Internet communications vendor, for $8.5 billion. Instead of trying to mash Skype into an existing Microsoft business division, the company has decided to create a new, separate Skype business division, with Skype CEO Tony Bates as the newly minted President. Bates will report directly to Microsoft CEO Steve Ballmer. In its press release announcing the deal, Microsoft played up the potential synergies between Skype and its own communications offerings, including its Lync VOIP platform, Outlook mail, Messenger instant-messaging, Hotmail Web mail and Xbox Live gaming service. “Skype will support Microsoft devices like Xbox and Kinect, Windows Phone and a wide array of Windows devices, and Microsoft will connect Skype users with Lync, Outlook, Xbox Live and other communities. Microsoft will continue to invest in and support Skype clients on non-Microsoft platforms,” said the release. Microsoft offered no timetable or further details as to when and how it will make Skype available as part of any of its existing product offerings. According to earlier reports, Microsoft was bidding against Google and Facebook for Skype. As my colleague Larry Dignan noted, the $8.5 billion Skype purchase price made for one expensive game of keepaway. Xbox 360 Kinect + SkypeTV: There is already a video chat feature on the Kinect but a Skype-login and interface could encourage more people to make this a part of their Xbox experience. Skype is already on some televisions so integration with the Xbox seems to be a good fit. Windows 7 OS + Nokia + Skype: This could be quite a powerful combination as more and more smartphones are equipped with front-facing cameras and make use of the 4G network, which means video calls will only become the norm on mobile devices. Plus, it gives the partners an edge against Apple’s proprietary Facetime application. Skype users are also able to send SMS messages from the Web to handsets so this could be a great bonus for future customers with Nokia phones running Windows 7. Outlook + Skype: By integrating your Skype contacts with your email address book to make voice and video calls, Microsoft is looking to the beefed up Outlook to better compete with Gmail/G-Chat/Google Voice. MS Lync, Xbox Live + Skype: These new groups will expand Skype’s user base, according to the press release. Last night, AllThingsD reported that Microsoft dealmaker Charles Songhurst was key in helping Microsoft CEO Steve Ballmer broker the Skype deal. Interestingly, Songhurst also was credited with helping convince the Microsoft brass to call off the Yahoo acquisition. post got the blog off to a bit of a slow start, and we’re glad we did. Christmas, we think it’s too good to miss. We are a worldwide service, delivering localized versions of Hotmail to 59 regional markets, in 36 languages. Over 350 million people are actively using Hotmail on a monthly basis (source: comScore, August 2009). We handle over 3 billion messages a day and filter out over 1 billion spam messages – mail that you never see in your inbox. We are growing storage at over 2 petabytes a month (a petabyte is ~1 million gigabytes or ~1000 terabytes). We currently have over 155 petabytes of storage deployed (70% of storage is taken up with attachments, typically photos). We’re the largest SQL Server 2008 deployment in the world (we monitor and manage many thousands of SQL servers). just that. Congratulations again to the Windows Live team for getting this off the ground, keep up the good work and can’t wait for more! This image illustrates how to get the error code from the pop-up you receive for a failed sign in attempt to Windows Live Messenger. Sign-in issues with Windows Live Messenger can be triggered by a wide array of probable causes. It might be due to as simple as an incorrect date and time settings on your computer, or as complicated as problems with your Internet connection. We’ve listed some troubleshooting steps below that may help resolve the problem. Follow the steps appropriate for your computer’s Windows Operating System. a. Click Start, click Run, type control timedate.cpl , and then click OK.
b. In the Date and Time Properties dialog box, confirm that the date and time settings on the computer are correct, and then click OK.
a. Click Start, type control timedate.cpl in the Start Search box, and then press ENTER. Refer to "How to enable Windows Live Messenger through your firewall" under the FAQ section, click the link for the firewall that is installed on your computer, and then follow the steps on the screen. However, if you have a firewall that is not listed, see the firewall manufacturer’s documentation or contact your firewall manufacturer to configure Windows Live Messenger. 4. Clear the Check for Server certificate revocation (requires restart) check box. b. On the Tools menu, click Internet Options. c. Click the Advanced tab. d. Under Security, uncheck the Check for Server certificate revocation (requires restart) check box. 5. Delete the Windows Live Contacts folder and Messenger cache. This will make sure that the locally stored information related to your account is refreshed on Windows Live Messenger. a. With your mouse, right-click the Start button, and then click Explore to open Windows Explorer. b. On the Tools menu, click Folder Options. c. On the View tab, in the Advanced settings list, select Show hidden files and folders under Hidden Files and Folders. d. Clear the Hide extensions for known file types check box. e. Click OK to close the Folder Options window. b. On the Organize menu, click Folder and Search Options. c. On the View tab, in the Advanced settings list, select the Show hidden files and folders check box under Hidden Files and Folders. Note: Before doing these steps, make sure to exit Windows Live Messenger and that it is not running on the background. To double-check this, open the Task Manager window and check whether the msnmsgr.exe is running on Processes. If it is, select the application and click End Process. If you are prompted, click Yes. WINDOWS XP: Click Start and then Run. Type taskmgr.exe and click OK.
WINDOWS VISTA: Click Start and then type taskmgr.exe on the Start Search box. Press Enter on your keyboard. a. Right-click Start, and then click Explore to open the Windows Explorer window. Note: In these examples, Windows Logon name is the logon name that you use to sign in to Windows. c. Delete the Windows Live Contacts folder. Re-launch Windows Live Messenger and try to sign in again, and verify if the issue remains. With BuddyFuse you can currently add functionality from Google, Twitter and Hyves to Windows Live Messenger. just like with your normal Messenger buddies. Support for more services such as AIM, ICQ and Facebook is planned for future releases. The Hotmail team has started rolling out updates to improve your Hotmail experience. 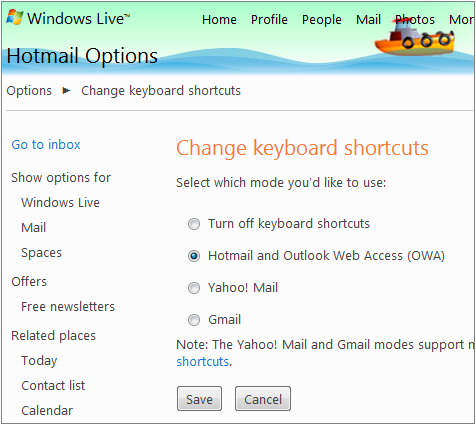 Most of these are improvements to current features and are meant to make your current Hotmail experience more efficient. In the coming weeks, we will post articles on how to use these updates. Be sure to check them out if you’re interested in learning more about the ever-improving Hotmail experience! .–> Download "Messenger 10-Year Anniversary Theme Pack"
Messenger Theme Pack: Celebrate a decade of chatting and sharing with free winks, emoticons, and more.